It was a lazy Sunday morning when I got a text from my friend Yasmin, who has a little boy, two years old. Well, we weren't doing anything, yet. We had thought about maybe going to the springs or the pool, whatever we usually do on a sunny Sunday, usually only including our own family. We don't do much hanging out with others. We should. They were going to a park that normally we wouldn't have access to, so we decided, sure, we would tag along. What time were they leaving? Well, we decided it was worth it to ignore nap time on this day, and that was a good decision. Of course, one of the twins was fast asleep in the car by the time we got to the park, but we woke her up and hoped for the best. Our friends met us, along with a childless couple and a single woman, under a large wooden gazebo where grilling was allowed. Down the grassy hill there was a small beach area where children were splashing in a lake. Further to the right, you could grab a boat and paddle your way across the waters. There was a nice breeze, good conversation and amazing picnic food. And the babies (all three of them) were the glue that held the whole outing together. If there were ever a lull in adult action, one of us simply commented on something the babies were doing, or another of us started playing with them, and the train of thought circled back around to the present, to what was right in front of us. It may have been a cop-out, but it was a natural one. Things that would have creeped me out without them became little adventures. The cockroach laying eggs, for instance. Shudder. The kids were spellbound. It eased the gross blow for me. The huge red velvety ant. Again, the kids were capitvated. 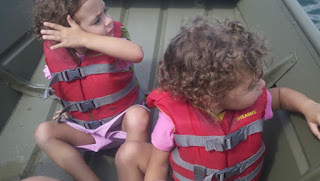 Yasmin and her family got a boat, but we stayed behind. Someone had said there were alligators in the lake! I don't care if there hasn't been an attack in 50 years. Why would I enticed a gator with my tasty three year olds? So, we went splashing and swimming instead, assuming with all the toddlers playing in the water that there was some sort of net apparatus separating the swimming areas from the gators. Only there wasn't. Once we found out, we managed to slowly move them away from water activities and we ate. 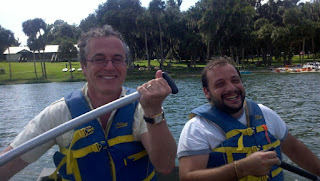 Then we decided we'd brave the lake in a boat, and Yasmin and Osvaldo (her husband) showed us the ropes. Until, of course, we saw an alligator. Fairly close. And we realized how very slow four inexperienced rowers are to one fast scaly swimmer. I got a picture of the beast, which shows him clearly when zoomed, but I don't know how to zoom it to show you here. ﻿Anyway, Yasmin and I depended upon the strength of these fine gentlemen here to get us back to safety. Which we did. Moral of the story: Go out of your comfort zone. Skip a nap, make new friends, go somewhere new. Don't go boating with alligators. There's adventurous and then there's too far, if you know what I mean.